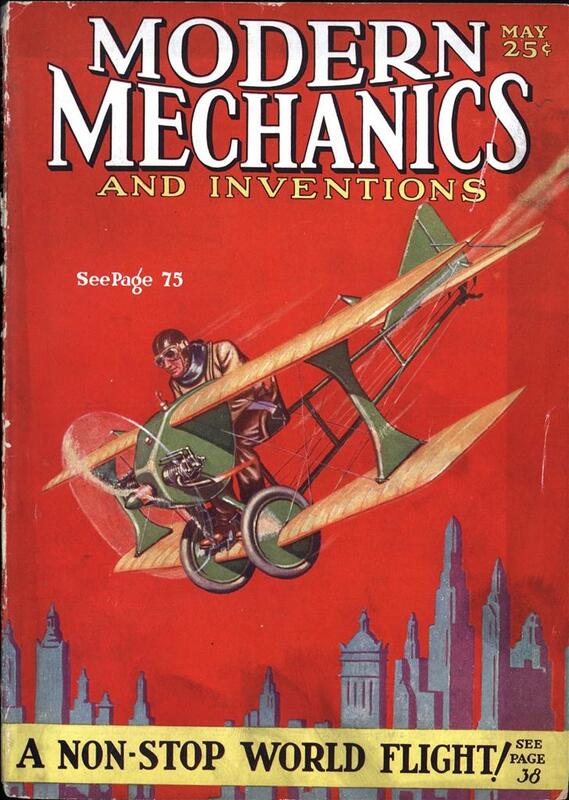 DEPICTED in this month’s Modern Mechanics’ cover is the tiny bicycle type biplane which has been developed in France by M. Pischof. The tiny biplane has a span of but 12 feet, weighs but 200 lbs., and is powered with a 4 h.p. opposed motor. This is evidently enough to give passable performance for the little ship was recently test flown by a grown man for a distance of 20 miles. M. Pischof, a Russian, has interested French manufacturers in the unusual features of his plane, among which are: front spar of lower wing acting as axle for landing gear; complete demountability of fuselage, wings, and motor assembly, which fold into a small trunk or large suitcase; tube fuselage constructed of seamless welded tubing on which is mounted the pilot’s seat (ordinary bicycle saddle with belt attachment) and demountable engine. It is said the manufacturers are going to place the plane on the market within a year, but at present no information can be obtained concerning the plans of the company, nor are plans being sold. Several years ago France was the scene of trials for just such an airplane, also designed and built by Pischof. That plane however, was larger, though with a 20 h.p. motor the performance was excellent. This later plane, pictured above, is the outcome of several years’ test work in the developing of a pint sized plane for commercial travelers and globe trotters and is reputed to be thoroughly practical. Thus France, too, is working for the advancement of the light airplane. The flying of light airplanes is much safer in proportion to hazards than is the flying of larger ships, given motors of equal reliability. In England, where the light plane has come into quite extensive use, tourists go hedge hopping from one town to another as a matter of course. The light plane lands slower, is more controllable, and can be set down in almost any cabbage patch and flown out again. Forced landings hold little risk for it, and consequently lower altitude flying can be indulged in, making cross country travel interesting. I wish I could find more. Sure it fits into a suitcase but is it allowed as carry on? I heard you like airplanes….. So according to the link by Toronto this thing has a max speed of 60mph and only enough fuel for 2 hours flight (the article didn’t say at what speed). Basically this has little or no practical application with the advent of the national highway system. @awbrynes — in terms of cross-country transportation, this isn’t all that practical. That’s not to say that it has little useful application, though; there are plenty of things where being up in the air is in itself quite handy (surveying/aerial photography, cropdusting, etc. ), and there are places where ground transportation is impractical because of the terrain or whatever. 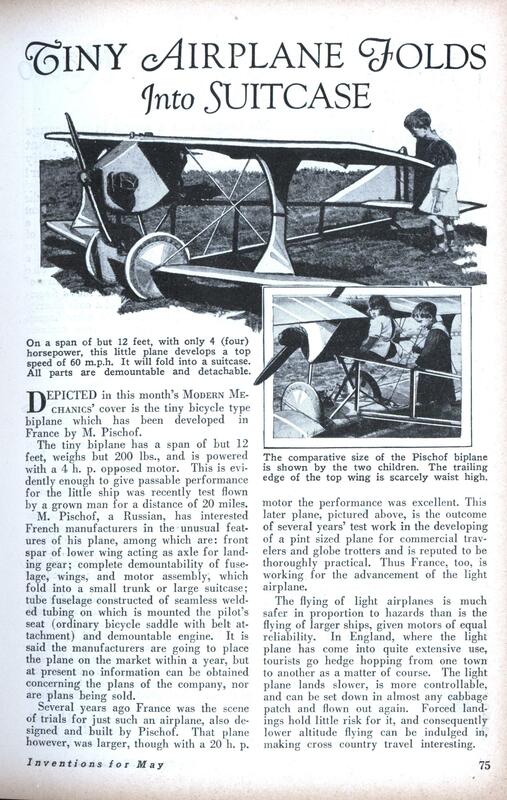 This would most likely be a legal ultralight in the US (it’s impossible to be positive as neither the maximum speed in level flight nor the stall speed were specifically given–the 60 mph speed sounded more like the “never-exceed” speed to me), and so could be flown without registration or a pilot’s license. It’s a truly remarkable design, especially given the early date.